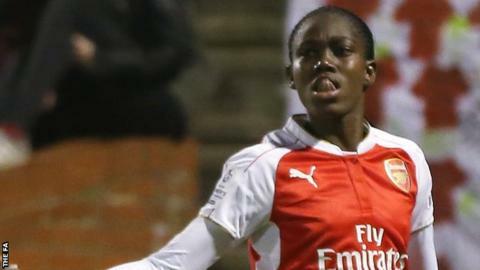 Asisat Oshoala marked her Arsenal arrival with a goal to help them overcome Women's Super League One newcomers Reading. Danielle Carter had an effort cleared off the line by Kirsty McGee, only for Dominique Janssen's low shot from outside the box to put the hosts ahead. Oshoala, who hit the post in the first half, rounded keeper Grace Moloney to add Arsenal's second after the break. Jade Boho Sayo reduced the arrears before Carter headed Arsenal's third. Arsenal Ladies: Van Veenendaal; Scott (Pablos Sanchon 80), Rose, Williamson, Mitchell; Janssen, Losada (Williams 66), Nobbs (Van de Donk 66); Carter, Oshoala, Corredera. Substitutes not used: Byrne, Stoney, Smith, McCabe. Reading Women: Moloney; Jane, Bartrip, McGee (Jones 78), Rowe; Hines (Estcourt 45), Ward, Bruton; Roche, Follis, Boho Sayo. Substitutes not used: Earps, Scott, Horwood, May-Walkley, Cox.